Informational displays are frequently provided for public venues such as the Shasta District Fair. The Shasta Mosquito and Vector Control District provides a large assortment of pamphlets and other materials containing helpful information about mosquitoes, other vectors of human pest importance, diseases of concern, and general pest control. We also offer tours of the District facilities that can be scheduled as time permits. 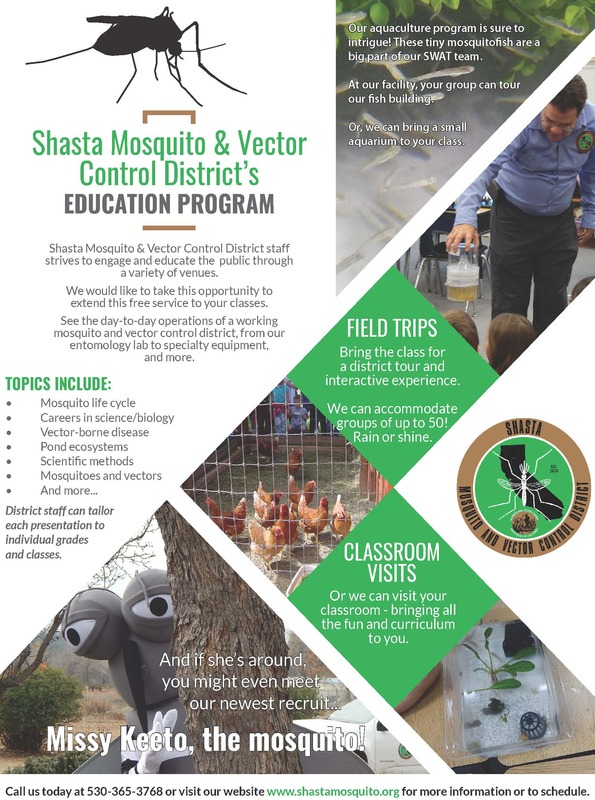 In addition to providing information at the District and at our website, the District can provide mosquito and vector control presentations to all age groups. Subjects of presentations include: mosquito life cycle, prevention and control, general vector information, West Nile Virus, biological control and integrated pest management, and careers in biology and vector control. If you are interested in a presentation please fill out our Request a Presentation Form or call at (530) 365-3768. Follow us on Facebook, Twitter, Instagram and NextDoor. Want to request a presentation or school visit? Click here.